Where do I start when it comes to Burning Blue? It's different. In a genre of literature so popular, it's hard to find anything similar to it. It's part mystery, part romance, and part something else entirely. I can't quite wrap my head around it to be perfectly honest. On one hand, I loved it. It was intriguing, kept me flipping the pages, and startled me with its eventual revelation. On the other hand, I was expecting something a little different when I went into it. Although there are such few male-narrated novels out there, this was one instance where I felt like having a male-narration was just easier when in reality, I wanted the female protagonists inner perspective so badly. Yet, at the end of the day, Burning Blue is the type of book I can only regard with warmth since truly, it's a book I can't imagine not recommending. 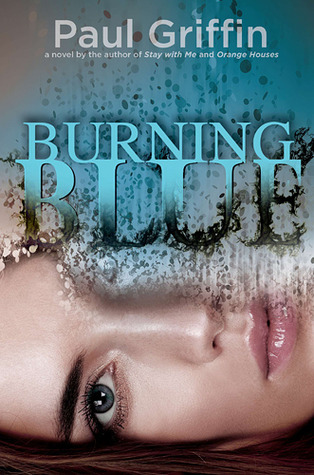 Burning Blue is one of those novels that starts out unusually slow, only to pick up and leave you flipping the pages, eagerly wanting to find out more. While the mystery behind Nicole's acid thrower is the obvious forefront of the novel, I was pleased to see the amount of depth it covered as well. Jay, the narrator of our story, has a strong and distinct voice, one that is a touch snarky, kind, and afraid. It is Jay, better than anyone else, who understands what Nicole is going through for he too has been marked out, labeled, and ridiculed in his past. As a victim of bullying, amongst other issues, Jay and Nicole bond through their understanding of one another. Yet, what I loved most about their friendship was that it didn't blossom overnight. If anything, these two had their own mix of troubles, hurdles to cross, and efforts to make to find true friends in one another. Yes, there is an undercurrent of romance between the two, but it's subtle and I appreciate that Griffin never allowed the potential romance to dominate the novel and turn it cliche. Everything was balanced out in such a way that spoke volumes about the writer's skill. In addition to Jay's narration, we are treated to small glimpses of Nicole's voice through diary entries that are scattered throughout the novel. It was here that my minimal issues with the novel began to creep forth, but it never become truly grating until the very end of the story. You see, Nicole's diary entries barely give us access into her head. It is Nicole who has acid splashed on her face and while we witness more into her psych than other outsiders, since we are privy to Jay's unique perspective, it still remains to be an outside perspective. Through Jay, we feel for Nicole and understand her predicament and grow to admire her courage in the face of her tragedy, but do we really know the girl beneath? Not really. Frankly speaking, I wish we did. Burning Blue is a stand-alone and, as such, it wrapped up perfectly, but I found myself wishing for more of Nicole's dark, gritty, and even depressed perspective into this issue. It made me curious to know what she was going through and while I'll definitely give Griffin props for writing a unique outsider perspective that was this thoroughly enjoyable, it still left a little to be desired. Well, that minor qualm aside, Burning Blue truly did have a plethora of redeeming qualities. Jay won me over with his narration and Nicole won me over with her budding friendship with Jay, but even more than that, the mystery in this novel fascinated me. More than a who, my mind was churning through the possibilities of why? By rendering someone else disfigured, you aren't making yourself any more pretty, so why do it in the first place? I was so impressed by Griffin's discussion of this issue, amongst others dealing with beauty, and the eventual revelation came as a complete shock. A complete shock. I've read my fair share of mystery novels and I'm sure if you look through my reviews, half of them will complain about having predicted the plot beforehand, but not this one. I love that feeling of being utterly surprised and if for nothing else, it's worth reading this book just for the mystery and the psychology behind it. If you're even remotely interesting in humanity and the types of issues that compel people to do the terrible things they do, you can't afford to miss out on this one. Overall, Burning Blue was a thoroughly impressible novel. I found myself strangely attached to all the characters - even the plethora of secondary ones - and I am thrilled to report that not only is the plot unpredictable, but this contemporary fails to fall back on typical tropes and cliches such as the Absent Parent Syndrome. Family is another important aspect to this novel and if I had the time, I could go on about all the themes this book espouses. Yet, more than that, it makes you think. In my opinion, it could have been even more provocative had we seen more of Nicole's perspective, but there's always wishing for a sequel from her PoV in the future...who knows? Either way, Burning Blue is an intriguing new contemporary you won't want to miss out on. So glad you enjoyed this, hun! I love a book that can make that turn around after a slow start and now you have me v.excited to read this! Despite those few flaws you had, you completely won me over with what you loved about Burning Blue. I am SO intrigued by the mystery. Unpredictability in a book (not real life, Brodie HATES not knowing ANYTHING in real life) is something I thrive on. When a book can completely blindside me with it's twists and turns, I love experiencing my jaw hit the floor. I'm also really happy to hear that there's no insta-friendship (or love!). It sounds like the relationship is well explored and believable. You write some of the most AMAZING reviews and now I NEED me a copy of this asap! I've only read one novel by Paul Griffin - Stay With Me - and I was bawling when I finished, so I have faith he'll win me over with this! Predictability is too often an issue in the books I read, so it's nice to hear the final revelation came as a shock. It's also really satisfying to know that the romance doesn't blossom overnight. With the book I'm reading at the moment, the main character is unrealistically obsessed with the love interest, and it's preventing me from enjoying it. Maybe I need something like this. :) Wonderful review, Keertana! Great review, Keertana. I have this one to read soon.. Very much looking forward to it now! Oh, this sounds like an interesting book! I'm glad that it managed to take you by surprise and that the characters ended up resonating with you. Lovely review! The whole time I was reading your review I was wondering if this was inspired by a true thing that happened here, in my town. A lady got acid thrown on her face downtown by a busy and popular park in an area that was always considered safe. The whole town went crazy trying to figure it out and everyone was terrified. The lady was scheduled to even go on Oprah (I don't think she did because I believe the truth came out before hand) and then when the truth came out everyone was shocked. Now I'm afraid to come out and say exactly what happened in case the story goes the same way but its a fairly well known thing that happened. And I kind of gave it away, I think. But I am SO curious about this book and if it DOES go the same way. And if it was inspired by true event. I'm going to ho look up the authors site now. I NEED to know! Round of applause again dearest. You have continued to astound me with your insightful reviews in every element of a story and I find myself thoroughly immersed into the world of your reviews and everything about them. I truly adore reading. This sounds like a very unique, engaging and emotional tale and a book that I very much want to read. It almost sounds like Thirteen Reasons Why with the protagonist not being the person that has been hurt. Still, I think maybe because this book is so image associated that looking in from the outside seemed the best approach. This is one of those books that would be hard for me to read in one way because I'd feel so bad for the sweet girl getting attacked. However, I do love the sound of the themes especially in a YA. Hm... I really must check this one out. Thanks for bringing it to my attention. Oh, I'm glad you enjoyed this one, Keertana! I haven't heard about this book before your review, but I'm definitely interested in reading it now. It definitely sounds like one of those unusual reads that everyone needs now and then. ;) And I'm also glad that the final revelation surprised you! It's a shame that more often than not books I read are far too predictable, so it's nice to have a book's climax surprise you for once. Amazing review as always, Keertana! I feel like I've only heard about this book in passing, but the synopsis somehow seems familiar to me. But anyways, your review of this one is as stunning as always, Keertana! I agree that this book sounds SO different- and it's good to hear that it, in fact IS. I was kind of worried that, while reading the synopsis, it would become just a dull mystery with a cliche romance, but it's great to hear that this isn't the case at all! I love the fact that this one surprised you Keertana, and I love books that utterly surprise me with their mystery. It doesn't happen often, but when it does, I love it! :D I think I would really enjoy this one, despite the tiny qualms you had with it, with the narration and all. Although, I whole heartedly agree that I'd like to see this book from the girl's perspective! Awesome review, Keertana ♥ Glad you enjoyed it! Speaking of books you'd never hear of...I would never have heard of this one if you weren't reviewing it! The story sounds great, I actually really like my romance with mystery, but I'll admit I am kind of held back by the fact that it's not told from her perspective. This seems like a story that NEEDS her perspective--she's the one that's been burnt, the one who's psyche we're most interested in. I'm sad it didn't got there. Great review, friend! "It's different. In a genre of literature so popular, it's hard to find anything similar to it. It's part mystery, part romance, and part something else entirely. " That sentence right there made me want to go out and get this book ASAP! I'm so glad you loved this book and that even though it was different, it didn't hurt your enjoyment of it! "If you're even remotely interesting in humanity and the types of issues that compel people to do the terrible things they do, you can't afford to miss out on this one." BURNING BLUE will appeal to both genders. Fans of mysteries and contemporaries will both enjoy the story within its pages. And I nominate Jay one of the most swoon-worthy heroes of the year, even if he isn't a werewolf/vampire/merman/other-tortured-creature-of-the-night.